The new (temporary) cruise port is only a 5 minute walking distance to downtown Palermo. The terminal is only being used for ferries end turnaround (embarking and disembarking) cruise calls. There are plans to renovate the old cruise terminal building. It was founded in the 8th century BC by Phoenician tradesmen around a natural harbor on the north-western coast of Sicily. Greeks called it Panormus, meaning all-port, because of its fine natural harbor. 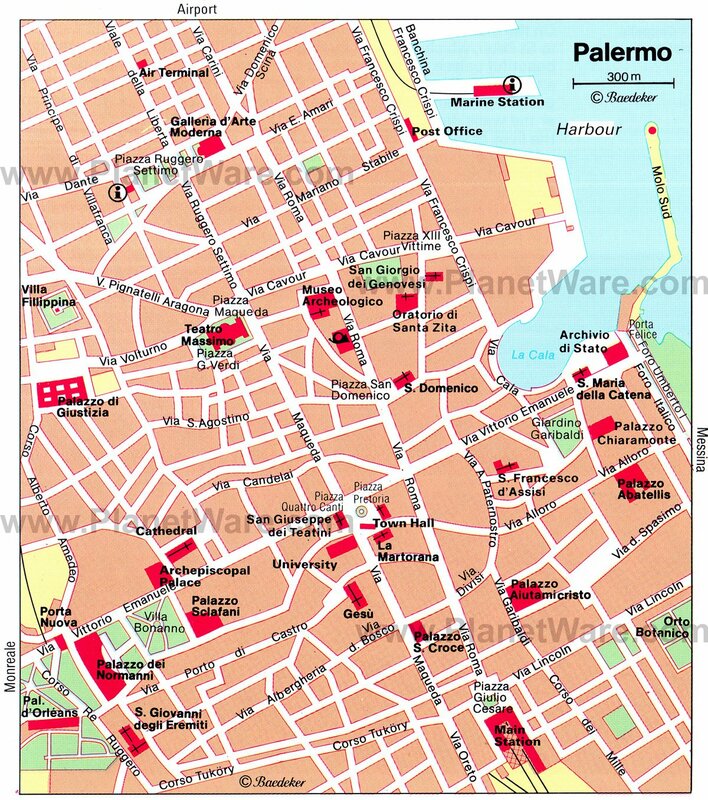 Palermo is widely considered to be the most conquered city in the world. The long history of the city assures that there is a lot to see, although the city as a whole, as well as some of the sights, are in need of repair. Today Palermo is a fast, brash and exciting city. The mix of arabic and viking influences is one of the strangest and unexpected surprises the city has to offer. Hop on/off buses stop right at the cruise terminal and provide 2 different routes for about 20 Euro. There are two routes: Line A runs every 20 mins for a 60 minute round trip. Line B runs every 60 mins for a 50 minute round trip. This bus is completely open on top, so take an umbrella in case of rain or head cover in the heat of summer. Buy your bus tickets for €15 from the booth at the exit from the temporary terminal. (They cost €20 from the ticket office by Stop number 1). Due to construction the location might change, the ticket booth attendant will guide you. There is also a small tourist train (Trenino) for 10 Euro sightseeing tour at the port. Explore Palermo, known for its rich architectural sights, great history, and culture: Visit the Politeama and Massimo Theaters, the Piazza Quattro Canti and the botanical gardens. The Capuchin Catacombs of Palermo:a somewhat macabre tourist attraction. Note: After dark Palermo can be a little "rough", walking the area near port is not recommended at night. Monreale, about 10 km, from Palermo. Take bus 389 from Piazza Indipendenza, a 40 minute trip. buses depart every half an hour. Set at about three hundred meters above sea level, the town overlooks the "Conca d'Oro," as the valley beyond Palermo is known. It is famous for its cathedral and its cloister, which represents the largest concentration of Norman, Arab and Byzantine art in one place. There are many daily markets in Palermo, which makes for nice souvenir shopping. The ceramics here are breathtaking. Fancy stores, including Chanel, Tods, D&G (Dolce & Gabbana) and Armani, can be found on Via Liberta. Popular with Palermo's own chic set, Fiorentino, on Via Liberta, has been selling beautiful jewelry since 1890. Internet cafe's are hard to find, but WiFi is available at some restaurants i.e. McDonald's about 500 meters from the terminal near the Teatro Politeama. Most shops and businesses in Palermo open from Monday to Saturday from around 8am until 1pm, and from about 4pm until 7pm, though many shops close on Saturday afternoons and Monday mornings. Sunday opening is becoming more common. Some large stores (Rinacente) stay open all day 7 days a week.